A big thank-you to all you swearers out there! I wanted my first blog post to be a thank you to everyone who helped make Swearball a reality. It takes lots of effort on the part of lots of people to bring a product to market. It was so much fun designing Sweaarball but in the end I could not have done it without all of you. 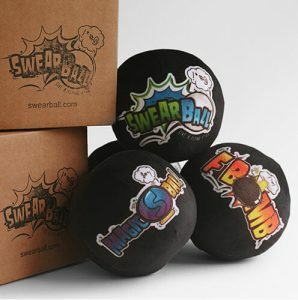 And to all of you who are now a proud owner of your own Swearball, thanks for supporting our balls! I hope you enjoy playing with them as much as we enjoy making them.